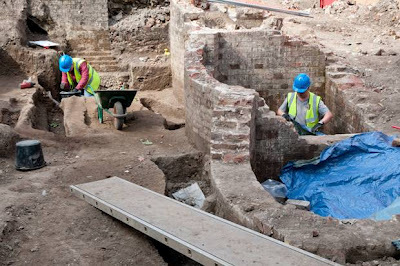 More than 500 skeletons, some dating back to the Middle Ages, have been discovered by archaeologists in Southwark, which lies on the Thames River across from London. The work has delayed the demolition of the current leisure centre at the Elephant and Castle ahead of a new £20m state-of-the-art facility. The local council anticipated that archaeology and pre-demolition works would begin and be completed by July this year, but following some archaeological discoveries during this phase, it will now be later in the year before demolition is expected to begin. Before the current leisure centre was built, the ground it was built on was originally home to a church and graveyard. The council expected that part of its archaeological work would unearth remains from the burial site, which dates back to medieval times. However, after initial excavations, it was discovered that the extent of the findings is greater than what was anticipated. Councillor Peter John, Leader of Southwark Council, said:" The remains will be treated respectfully and we will be following the Ministry of Justice's guidance to peacefully re-bury or relocate them. The leisure centre work will resume as soon as we've sensitively dealt with this issue."